After charting the publishing productivity of CLA Journal by decade, we decided to take a closer look at the 1970s. The 10-year span from 1970 through 1979 represents the journal’s most prolific time period with 404 articles, 11 bibliographies, and 2 interviews for a total of 417. We took note that 1974, 1976, and 1977 represented the highest number of publications during the 1970s with 57, 51, and 49 respectively. Those were the only three years from 1957 – 2012 when the journal published more than 40 articles. In 1971, 1972, 1980, and 1981, 40 articles were published. 324 unique contributors published articles during the 1970s. 42 of those authors produced two or more articles. Those 42 authors produced 109 entries or about 27% of the articles during the 1970s. It turns out that the 1970s saw the most number of repeat authors in CLA Journal. That time period was the only decade when over 40 scholars submitted more than two articles to the journal. During the 1970s was when the most number of scholars published more than one article in the periodical as well. 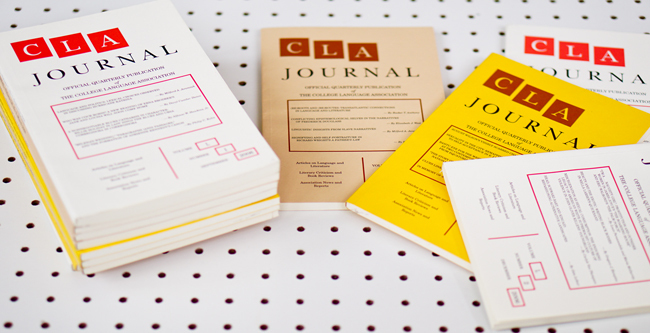 Growing numbers of scholars were entering the field during the 1970s, and they began to make contributions to CLA Journal and other publications. Bernard W. Bell, Trudier Harris, Maryemma Graham, and William L. Andrews, for instance, published articles in the journal for the first time. In addition, Darwin Turner, Therman B. O’Daniel, and Edward W. Farrison, all of whom had been publishing in the journal since the late 1950s, continued publishing in the 1970s. By the 1980s, more shifts were taking place in African American literary studies. O’Daniel, Turner, and Farrison had, for some reason, ceased publishing in CLA Journal. New and expanded opportunities in the field also gave scholars a wider array of publishing options, which might have explained why the overall contributions to the journal was much less during the 1980s and 1990s than in the 1970s.